"NeonTetra" by Corpse89 Licensed via Wikimedia Commons. Neons are an all-time favorite among freshwater aquarium owners. In any given mouth approximately 1.8 million neon tetras are exported to the US alone. Their petite size most certainly contributes to their popularity. They rarely exceed an inch and a quarter in length. You can keep an entire school of them in an aquarium no bigger than 5 gallons. They are the perfect choice for desktop nano tanks. These dazzling little beauties will add brilliance and color to any aquarium. The iridescent blue horizontal stripe that runs just above their spines almost glows under aquarium lights. Just below the blue, a second bright red stripe runs from mid-body to the base of their tail. These radiant colors are transposed against a translucent body. Their fins are transparent. You can see right through them. There is a slightly more colorful member of the tetra family. Neons and cardinal tetras look very similar in appearance. Put them in the same aquarium together and most people wouldn• t be aware they are two different species. Both have metallic neon blue upper bodies and a brilliant red stripe in the center of their bodies. This stripe is found mid-body running to back the tail in neons. The stripe runs the entire length of a cardinal• s body. Neons are by nature a skittish species. They spook rather easily. They are also very small fish that could easily be perceived as a source of nutrition by larger species. They do however make excellent community fish if you take these factors into consideration. An abundance of plants and or rockwork will provide sufficient hiding place and help them feel confident in their new surroundings. Avoid keeping them with species that will grow large enough to ingest them. Following these simple rules will keep your neons healthy, happy and most importantly, alive! Neons are mid-tank swimmers. They are shoaling fish. Shoaling fish do not cope well when isolated from other members of their own species. Many will not survive in solitude. It is advisable to have at least four neons in your aquarium. This will help to ensure that they adjust well to their new environment. There is yet another factor to consider when deciding whether these fish are right for your particular aquarium. Tetras are notorious fin nippers. The more neons you have together, the higher the likelihood that this will become a problem. Long, flowing fins like those found on a betta fish or a fancy tailed guppy will most likely prove to be a taste treat tempting to pass up. This is a hardy species. These omnivores have an extremely high survivability rate in captivity. They are not finicky eaters. A good quality flake food for omnivores is the perfect staple for their dietary needs. The average life expectancy of neon tetras in captivity is 5+ years. The exportation of species for hobby fish trade began to boom shortly after World War II. Neon tetras were among the first species to be sold under the label, tropical fish. Their introduction to Europe and the US helped to fuel what is now the multi-million dollar aquarium trade industry. At one time these fish commanded an insanely high price tag. Commercial fish farms have since brought their price well within a range of the average aquarium enthusiast and made them one of the most popular fish in the world today. Piranhas have red throats, razor-sharp teeth to rip flesh with ease, and silvery gold flesh (red-bellies have red bellies, of course). Piranhas are native to South America and Guyana and it's against the law to bring them in and out of most countries. They are quite dangerous and aggressive fish since they reside in schools, which has a tendency to promote a competitive environment. When planning a piranha aquarium , fish size should be regarded first. 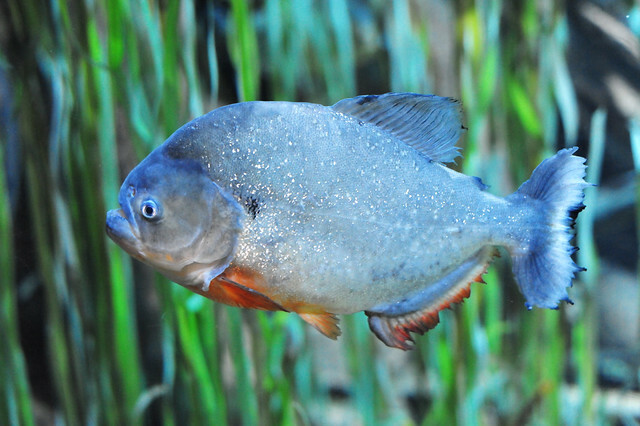 Grown piranhas have been known to develop to two feet long in a big enough tank. Piranhas are in addition group swimmers, which means they'll need room to roam. Strive to provide two gallons per each inch of piranha fish. An aquarium six feet long by two feet by two should allow ample hideouts. A minimum fifty-gallon aquarium is recommended. Piranhas (Pygocentrus (Serrasalmus) nattereri) are very sloppy eaters. Ten to fifteen percent water switch-outs every seven days will ensure waste not trapped by the filter system is taken away. Regarding filter systems, almost all piranha aquariums will need at least two devices to manage the process, especially if the aquarium is fifty or more gallons. Nitrate concentrations, which have harmful effects on piranhas particularly, should be monitored directly. PH levels ought to stay between six and one half and 6.9 to copy those of the Amazon where piranhas came from. Water degrees in a piranha enclosure should be about eighty degrees to encourage piranha movements. Many piranha owners employ additional water pump devices to prod piranhas to swim in opposition to the waves as in the River of the Amazon . The practice additionally promotes metabolism levels, stimulating eating habits. For decoration, it's preferable to keep the fish tank low lighted to encourage piranhas to venture into open water. Man-made fauna is recommended. Any rocks and synthetic centerpieces will need to be tightly fastened, seeing as strong piranhas will hurl pieces around, potentially breaking the glass. Piranhas' diet consists completely of proteins. Living meaty rations such as non-fatty poultry or beef and fillets of fish may be administered daily or bidaily. Feeder comet fish are a non-expensive choice, but piranhas will dine on practically any variety of meat. Experiment to find what yours favor. Whatever you do, don't leave your fingers in the water too long! Obviously, piranhas are aggressive fish, which makes your choice of tank mates relatively slim. However, some other aggressive fish can co-exist with them. For example, tetras, cichlids, Oscars, pleco catfish and pacus. These fish are by and large excellent defensive fish, while the plecos have tough outer shells and can grow to larger, intimidating sizes. Pacus resemble piranhas and will fight back. Tetras are quick and small with sensory instincts which allow them to stay clear of piranhas. Piranhas also aren't likely to give chase to such speedy, small cohabitants. Cichlids may or may not coexist with piranhas; they have simply been known to team up against them to survive. Oscars are large and in charge and inexpensive to replace if they're slurped by a fat red-belly. As a rule of thumb, don't introduce too many new experimental tank mates into your piranha tank. Add them one by one to see how they adapt. Whatever you do, don't get too attached to them until you know they're going to make it! We hope you've benefited from this informational piece regarding piranhas. Feel free to visit AquariumUniverse.com for more piranha aquarium information including photos and videos, additional guides and aquarium resources. How Do You Properly Maintain a Pet PIRANHA Tank? Owning a pet piranha is not just about setting up their home once and then forgetting about it. There is a little bit more involved in maintaining a piranha tank and I'm hoping that this article will provide you with the necessary steps and guidance. 2. Keep an eye on algae. 3. Clean your filter components. From time to time you will have to clean the filter and its components. However, it is important to note that not all components should be cleaned at the same time. Over time, bacteria builds up on the filter components and some bacteria is essential for your piranha's health. Most aquarists will recommend cleaning one component per week. 4. General clean-up and water changes. b. Make sure the new water is the same temperature that is already in your aquarium to avoid shocking and stressing your piranhas. c. Add the new water slowly (i.e. : 4-5 cups every 15 minutes or so). This may seem complicated at first, however, the more you do it, the faster and easier it becomes! is about 6 cm and life span of 3-5 years. · Temperature: 24°C - 26°C. · General Hardness: 30—150 ppm. Lipstick characins are omnivorous and will readily take most types of aquarium foods. They will accept flake and pellet and also benefit from most frozen foods. We recommend AI Naturals Range Frozen Brine Shrimp, Krill and Tropical Mix for these fish. Ideally, add live foods such as Black worms and Daphnia to their diet as well. Best kept in schools (minimum 5 in the group). Different characin species can generally be kept together with no problems. Lipsticks will also mix readily with a wide range of species and are generally an ideal community fish. It is not a good idea to mix them with species that grow very large as predation can be a factor due to their smaller size. Beware of elongated fins on some species as they can be nipped. Note: as they are omnivorous, they can be prone to eating aquatic plants. 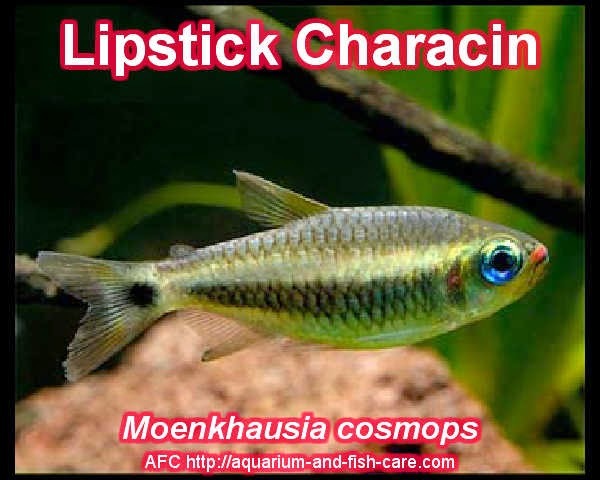 The name cosmops in ancient Greek means “with a decorated face” and the Lipstick characin certainlyhas a striking one, with red lips, blue eye shadow and a shimmery scale pattern it’s a very attractive little characin. Note: Being new to science only one variant is known to exist. This species, like many in its genus, shows no sexual dimorphism at all. This makes sexing of the fish difficult. Best to set up a breeding program with small schools. This species has only recently been described scientifically and is considered to be a close relative of the well known species Moenkhausia sanctaefilomenae (Red eye tetra) and M oligolepis (Glass tetra). Lipstick characin have only recently (within the last 4 years) started to be imported into the fish keeping hobby and have had great success. Being unique they have fitted in well with many people’s community tanks. Given a varied and well balanced diet with enough tank space to openly school, looking after the Lipstick characin is something any fish hobbyist can do. The Penguin Tetra is actually two related species, Thayeria boehlkei and Thayeria obliqua. The easily seen differences between these species are quite small. Both species have a tendency to swim in a tail down position, but this is more pronounced in Thayeria obliqua. Thayeria obliqua has a shorter black line than Thayeria boehlkei, and Thayeria obliqua grows a little bigger although these are both small fish. The species most often available in aquarium shops is Thayeria boehlkei. Some people prefer to keep the name Penguin Tetra for Thayeria obliqua and call Thayeria boehlkei the False Penguin Tetra. There are several other common names for this fish, some of them, like Penguinfish, Penguin Fish, etc are also based on its perceived resemblance to a penguin, while others like Short Striped Thayeria do not. In Australia, it is often sold as a Hockey Stick Tetra. Certainly the shape of the prominent black line is reminiscent of the shape of a hockey stick. Thayeria boehlkei grows to about one and a half inches (4cm) long while Thayeria obliqua can get a little bit bigger. They come from the Amazon River and its tributaries in Brazil and Peru, preferring slow moving stretches with a lot of plants. The Penguin Tetra is actually two related species, Thayeria boehlkei and Thayeria obliqua. The easily seen differences between these species are quite small. is a tropical fish. 24 degrees C (75 degrees F) is a suitable temperature to set your thermostat. The water they are used to in the wild is soft and acid, but in captivity they will adjust to neutral pH and some hardness. The penguin Tetra does better in clean water and care needs to be taken with the water quality. They are sensitive to Ammonia, Nitrite and excessive concentrations of Nitrate. Like many tetras, the Penguin Tetra is an easily fed omnivore. It will eat all normal aquarium foods, but will enjoy some live food like mosquito larvae and Daphnia. Frozen foods, including frozen blood worms are also appreciated. The Penguin Tetra is a peaceful schooling fish. I suggest a minimum of four, and preferably more be kept together. They can be kept with most small, reasonable peaceful fish, including: Red Eye Tetras, Neon Tetras, Cardinal Tetras, Silvertip Tetras, Gold Barbs, Cherry Barbs, Pristella Tetras, Rummy Nose Tetras, Harlequin Rasboras, Scissortail Rasboras, Lemon Tetras, Emperor Tetras, Head and Tail Light Tetras, Glass Bloodfin Tetras, Swordtails, Platies, Mollies, Zebra Danios, Glowlight Tetras, White Cloud Mountain Minnows, Black Widow Tetras, Rosy Barbs, Tiger Barbs, Paraguay Tetras, Buenos Aires Tetras and Colombian Tetras, as well as the Corydoras catfish like the Peppered Catfish. A school of Penguin Tetras can usually even be kept with slow long finned fish like Siamese Fighting Fish, Guppies and Endlers Guppies. There is not much difference between the sexes of the Penguin Tetra, but when in breeding condition, the females get a rounder belly. Thayeria boehlkei is the Penguin Tetra most likely to be available in shops and this fish is reasonably easy to breed. I suggest a water level lowered to about 6 inches (15cm) acidic and very soft water with a temperature of about 27 degrees C (81 degrees F). There should be fine leaved, bushy plants in the breeding tank. The Penguin Tetra is a prolific breeder in the sense of producing a lot of eggs. A female of this little fish with a very well rounded belly can produce as many as 3000 eggs. These are very small. The male produces a large amount of sperm to try to fertilize all these eggs, and this can contribute to fouling the water. Partial water changes are recommended to maintain the high quality of water that the fry need. The addition of an aquarium fungicide is recommended to help protect the eggs from fungus early on. The eggs should hatch in as little as 12-18 hours. The babies are very small, and need protozoa (infusoria) at first. Although the Penguin Tetra is a delight in an aquarium, as with all pets, do not allow them to get into ecosystems they are not native to. Aquarist are frequently blamed for this, and there is no doubt that there are cases of accidental, or deliberate, release of fish by aquarists, but my own research suggests that the worst culprits for this historically have been governments and their departments. Steve Challis has many other fish fact sheets and other articles on http://www.bettatrading.com.au.